Adhesive mount antennas are small, low profile antennas that can be mounted onto flat or slightly curved surfaces using a strong adhesive tape. The adhesive mount technique is convenient for easy and quick installation on mounting surfaces where holes cannot be drilled for mounting accommodation. Adhesive mounts are commonly used for miniature patch and dipole antennas. 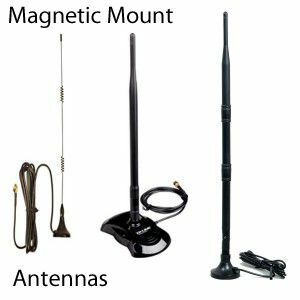 Two popular adhesive mount antennas are I-bar antenna and T-bar antenna. I-Bar antenna is a thin, flat or cylindrical omnidirectional antenna that mounts on its back using 3M adhesive tape. The I-bar can either have a patch antenna or a dipole antenna fabricated on a PCB, enclosed in an IP67 plastic protective cover. I-bar antennas connect to devices using a flexible coaxial cable (LMR-100 or RG174) that terminates mostly to RP-SMA connectors. The cable is attached to one end of the antenna which is mounted vertically. Data Alliance can customize both the coax type and the connector-type. A T-bar antenna is also a flat and slim low profile antenna, slightly longer than the I-bar. Its connector cable is fitted at the center and is mounted horizontally, forming a T-shape with on the mounting surface. The antennas consist of an omnidirectional dipole mounted on a PCB. Its outer plastic cover provides UV protection and is rated at IP67. It also uses an LMR-100 or RG174 coaxial cable terminated to a flexible choice of connectors. T-bar antennas are commonly used in vehicle tracking systems and cellular vehicle devices. Adhesive mount antennas can easily be mounted on walls, glass windows and vehicle bodies. Even with the IP67 rating, it is recommended to mount the antennas under an eave or overhang when using outdoors. 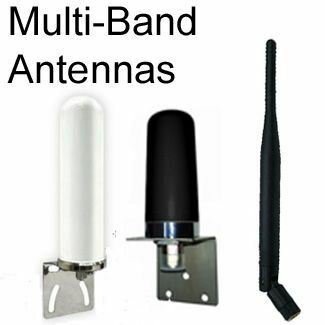 I-Bar and T-Bar antennas are available for use in a variety of frequency bands including 2.4GHz, 5GHz and cellular applications such as LTE, GSM, CDMA, UMTS, and WCDMA.